Reiki is a Japanese technique for stress reduction and relaxation that promotes healing. It can be liken to an oriental version of spiritual healing and is based on channelling a form of energy. This energy can be referred to as chi or prana. Have you heard of 'chi'? If you, or a member of your family practices Tai Chi or Chi Kung /Qigong, it is this, energy that you are working to promote. The energy flows through the human body along the meridians and nadis that connect the vital organs. Though these channels the whole body is nourished and supported. When there is a blockage in one of the channels and life force is reduced illness can soon follow. There are a number of Japanese techniques, which can be used to unblock, the meridians or energy channels. An acupuncturist uses needles to encourage the energy to flow. 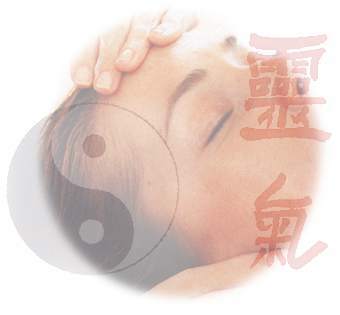 A Shiatsu, practitioner works with finger pressure on acupuncture points, to achieve similar effects. While the Reiki practitioner gives a very simple, non-intrusive treatment, working with their hands on or off the body. That is a brief look at the Japanese energy system. Now we move onto India, where the same energy is referred to as 'Prana'. Breathing exercises and yoga techniques were developed to bring (Prana) energy into the body. In India they think in terms of charkas, instead of meridians. A large percentage of Western people have heard of these energy centres that run the length of your body. Crown; Violet or White, Third Eye - Indigo, Throat - Turquoise, Heart - Green, Solar Plexus - Yellow, Sacral - Orange and Root - Red. When your life force energy is high and flowing freely, you are healthy, and happy. If your life force energy is low, you are vulnerable to illness, depression and stress. According to the individual's needs Reiki works on the mind, body and spirit where ever the root of the problem may be. This energy will also reach and heal the aura, which is where illness is detected before it takes form in the body. It strengthens the body's own healing ability and rebalances the energy. This therapy is an extremely effective natural form of stress relief; bring a feeling of total well-being. There are many added benefits, peace of mind by creating a calmer and more relaxed attitude to life. It relieves physical ailments, provides comfort and ease during grief and brings peace to the terminally ill; promotes self-awareness and personal growth along with mental clarity and focus. During treatment there is an input of pure energy, which accelerates the body's natural ability to heal physical ailments and disease. Once in the body the energy seeks the area where the problem is manifested and clears away all debris, from the channel. Hence the detoxifying effect it may have the day after the treatment. The aim of this treatment is to bring balance to the body and restore the vital life force *. *This is the difference between life and death, the non-physical energy that animates from within, and surrounds all living things. Reiki is not a religion and requires no particular belief system to experience the wonderful healing power. A good question. Why learn Reiki? From the day you decide to work with Reiki, and begin the energy exercises you will feel the energy build, then after the practical day you will feel tingling in your fingers and possibly other parts of your body. The body will start to re-balance it-self, therefore you may experience deep emotional feelings, flu like symptoms, energy, highs and lows as if on a see saw. Each individual will have a unique experience as each person's life follows a different path. Basically your body is detoxing however many years of rubbish it has been storing, be it emotional, physical or spiritual it is a bit of a bumpy ride for some individuals. Whatever your journey, it is very humbling. Then various levels depending on teacher. Level I Upon receipt of your deposit ~ receive the manual and audi cd, explaining all aspects of the first level and the meditation cd. Work with the information for 2 or more weeks before attending the practical day course. Internet Discussion group for all Reiki students, Reiki Share and full support thereafter. Plus lots of practice. Sometime after level I you can take the next step to become a practitioner Okuden level 2, homework + 1 practical day. At this level you can treat members of the public provided you have Public Liability Insurance. Then for a few students, the Master /Teacher level Shipden homework + 2 practical days. I would suggest at least six months to lapse after your level 2 was attained, depending on your experience, it could be considerably longer. Reiki is a life long commitment. Therefore the decision should not be taken lightly. Once you have been aligned to the energy, it will stay with you throughout your life. How you use that energy and how often, will make a difference to how clear a channel you are. It seems, as if we come to Reiki without making a conscious decision, it just seems the right thing to do at that point in time. Whatever you decide, it is life changing. There are many Master/Teachers in the world it is finding the person that sits right with your way of life, thinking, values and how they present Reiki. Also the financial aspect, someone who you feel comfortable with and the type of Reiki you are drawn to. Ask questions? Have a treatment. Ask for information. It may seem strange, but usually 'When the student is ready the teacher will appear'. Remember life is a journey of discovery; it can be black and white or a spectacular explosion of vibrant colour. To find out what Angelic Reiki is; what it is like to have a treatment, or to attend a workshop, in which you will learn this wonderful way of working with Angels, Ascended Masters go to this Angels link to visit our sister site.